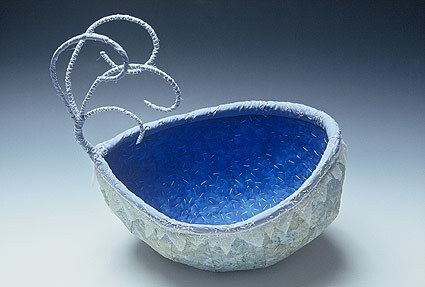 I work with textiles and wire to create 3-D works of art, ranging from vessels/baskets to figures and birds. Sizes vary from a few inches to a few feet. My technique is very versatile. I can create just about any shape I like. My work is light weight and not breakable. I am very flexible when it comes to commissions. I will tell you up front if I don’t feel that I can accommodate your wishes. Prices range from $150 and up to $2000.